To paraphrase Frankie Boyle; they might be c****, but that's OK. I like c****. while you are at it, Iain, Yougov is pulling a fast one with its polling, its changed its weighting over night. You can't do that as a serious pollster. They are getting no crossover at all. Thats not a poll, thats just a party line vote. It means sod all if you get no crossover form any. May as well pluck numbers from mid air. and if you look further, they changed the weighting numbers over night. Yesterday it was 333 cons, 241 lab, 146 libdem. Today its 326 con, 260 lab and 183 libdem. Thats why, they boosted up the lib dem numbers and lab numbers and dropped con. Labour were delighted that Tony's love-bombing worked on Murdoch. The tables are turned and they're in full bleat. is the 'C' word that is banned here CAKE. How is the diet going BTW? + doing LBC again? Takes one to know one. I hope that the words are given wide currency. What voters vote for what they want in their voters is judgement. Mandelson and Brown have show a distinct lack of it since the sun came clean. An interview is not just a question and answer session it is a test of character. brown failed that this AM with Boulton (and he failed it again with Marr earlier in the week) Mandy has now done likewise. Mandy was on the 6.30 news telling a hapless reporter that he said Chump, not...well, you know. He then went on to berate her and all reporters, as he did on Breakfast News the other day about him working with the Tories when Labour are dumped out of office next year. So you are all liars and he's still Mr. nice guy...It's true, he said it himself...more or less. Roll on May the 6th. He said he called them 'chumps' - I think half of new labour are chumps too. Uneleceted as he is - he still holds a position in The House of Lords and he speaks like that? disgusting - surely they have standards? a very useful part of the female body. Tush, tush Iain. A dangling modifier. Unlike you - though, to be honest, I would prefer that you banned the Sun rather than the "c" word. Mandelson has just pissed all over any chances that he may have had (or wished for) of becoming Prime Minister. The Sun has done us all a great service. Does anyone else think this is a political risk? Eight months to go and Murdoch unites the Labour party in a way almost nobody else could? Why not chip away at him and declare before the election? 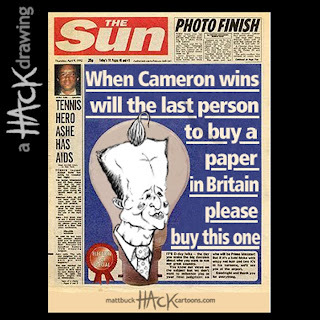 "Hack".....at last someone who can make Guido's "RichandMark" looked talented. Presumably he wont then be 'putting himself at their service' when he's booted out of office. I wondered if the Marr question was a sign that the automatic deference that Nu Labour expected was now not a foregone conclusion. The very public change of support by the Sun (great centre page pull-out by the way) suggests that the current government has lost that deference. Just goes to show that minions can be pushed to far. Mandleson's reaction just underlines the hurt feelings of the betrayed aristo. I think the stress levels within members of the Labour Party must be quite high at the moment. Even Tom Harris "lost it" on his blog when he referred to somebody as a moron! As the the Prince of Darkness, well, he's simply showing his true colours isn't he. He doesn't like to be thwarted. Did Mandleson REALLY just say "small earthquake, no-one dead" on Newsnight, concerning the Sun switching to Conservatives, moments before Emily Maitless switched to showing news reports from Samoa? "New YouGov Poll for BBC" --- it is for SKY. And the entire methodologies and point to these polls is dubious. Kellner the head of YouGov is reportedly a left supporter. We have had 2 weeks of untrammelled tory knocking - all monitored by this new poll. I wonder what anti tory prejudice is planned by the BBC and Labour all covered by YouGov next week? Yhis is my official conspiracy. What standards are they? And would the likes of Bob Piper and Tim Ireland agree? We all know Rupert likes to back the winner, but was it linked to preserving his dominance of the UK media, in the same way that Ecclestone's donation could be seen as connected with a reprieve for tobacco sponsorship? I see Labour will now freeze pay of the senior civil service but not the rest of the civil service - pure class politics that will do them nor us no good at all. Gordon also plans a firesale of public assets to get cash in quickly . At the start of this Government in 1997 Gordon sold off our gold reserves for a song. Now he plans to do the same again. Like a penurous debtor chopping up the furniture for firewood in a vain attempt to avoid the reality of the situation HE has created. I wonder too, can we insist that if assets are sold off cheaply to the private sector, Ministers don't then walk into lucrative jobs with those companies when they are made redundant next May. As they poked that corrupt Labour mob in the eye, yesterday I bought a Sun. I will not be taking out a subscription, however their double page centre pullout to keep poster was intersting. In this poster were a whole range of things showing how GB used to be in the ratings and where it is now. (Defence, education, NHS, crime. etc) If you needed a good reminder while the criminal mob should go this poster showed you. In fact, "The Sun Are C**** Says Mandy" is highly debatable, but your article makes it sound as though it's a fact. Our star witness is the incredibly reliable, independent (from everyone except R. Murdoch) and trustworthy, er, Rebekah Wade. Above this article, you are fuming about an ad hominem attack on you in the Daily Mail. Yet here you are, ONE POSTING DOWN, doing exactly the same on the slenderest of factoids. He'd hardly call them pricks, would he? He thinks they're more useful. Shouldn't Harman be stepping in here? Medium term this will not do the Tories any good. And it will help motivate lots of people who have doubted the party while the Sun "backed" it ie Thought that labour would win the General Election, which is what the Sun's support betokens. The switch has been timed tendentiously, just barely possible that many will see through that. Many more will come to realise that the interests of the billionaires who own such papers, and their echoes in the media, including the BBC, are not thsoe of the British people, resident in Britain.